Going into donut shops was one of my greatest joys in life as a kid. I knew exactly what I wanted every time: maple long john with chocolate milk with a back-up plan of anything chocolate glazed or pink and covered in sprinkles. Gold, every time. But these days, my palette is much more refined. I go for the frosting-free kinds, the ones without holes, and certainly avoid anything with the terms ‘long’ and ‘john’ in it. They’re just plain childish. Nah, just kidding. My donut preferences haven’t changed at all since I was a kid. In fact, they’ve probably gotten worse. But every now and then it’s good to branch out and ‘upgrade’ as we age. And if that means adding a strawberry danish to the rotation every once in a while, I’m OK with that. Not all changes are bad, after all. Although bangs, bangs are usually a bad idea – especially for us greasy forehead types. Too, much, oil. 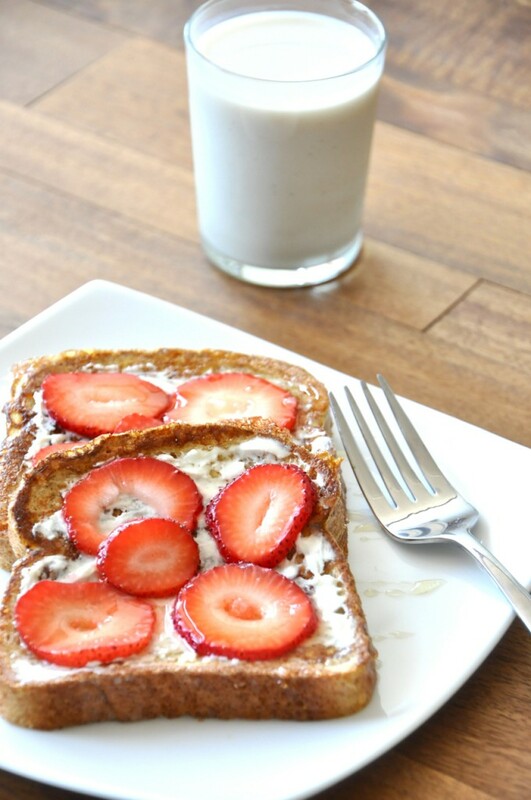 But enough about donuts and who shouldn’t wear bangs and onto the finer things in life, like french toast. When it comes to this breakfast classic, I’m usually the ‘give-it-to-me’ straight type: plain with a little butter and a drizzle of syrup. But these days, I’m upgrading to classier flavors, i.e. strawberry danish. 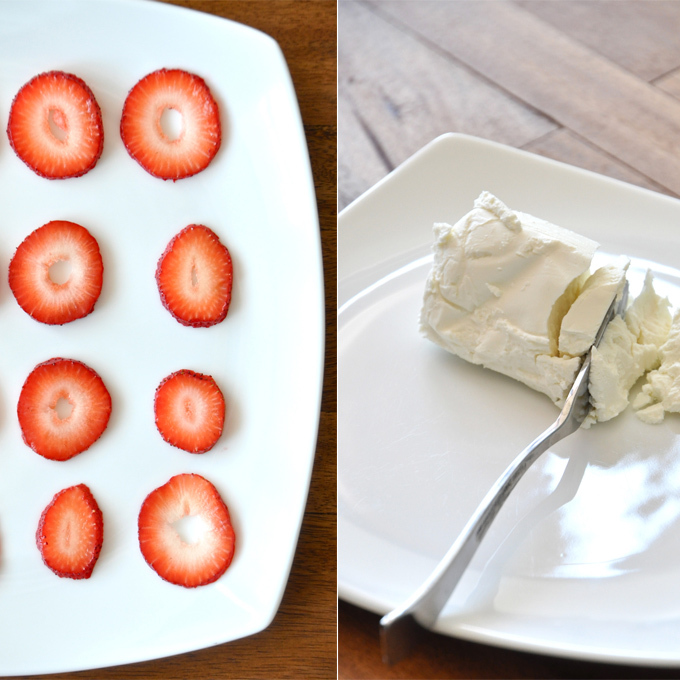 Once I discovered the flavor pairing of goat cheese and strawberry, the idea was to apply it to as many foods as I could think of. And the first one that happened to cross my mind was french toast. And the result? 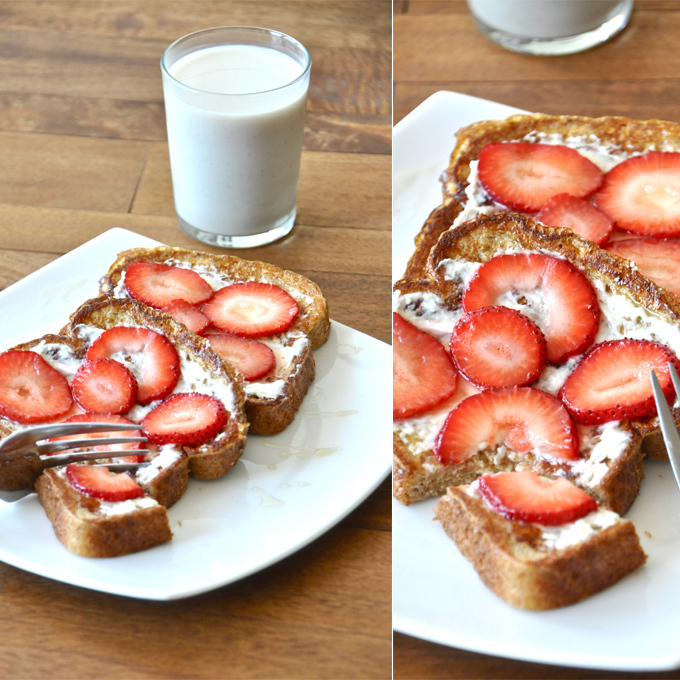 French toast that tastes just like a strawberry, cream cheese danish. Now that’s the type of breakfast I’m willing to branch out for. 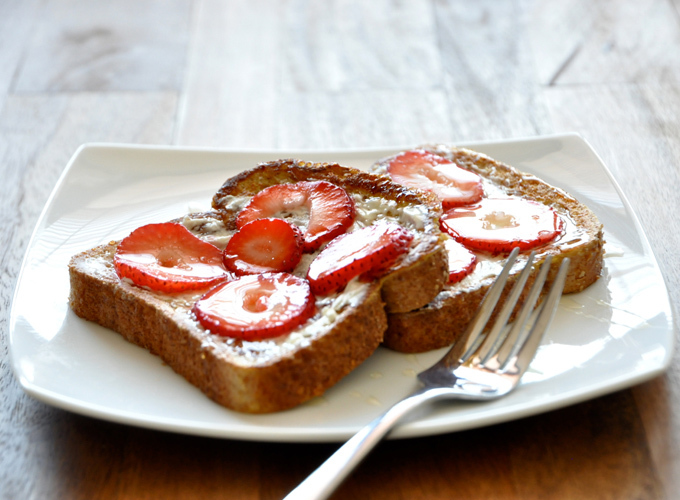 This twist on a breakfast favorite combines the classic flavors of strawberry and goat cheese in an unconventional way, to yield a french toast that tastes JUST like a strawberry danish. That's amore. Whisk eggs, milk, vanilla, and cinnamon in a shallow dish. Dip bread into mixture and place on lightly greased hot griddle. Drizzle remaining 'batter' on top of bread. Cook until well-browned on each side, about 2 minutes. Remove and plate. 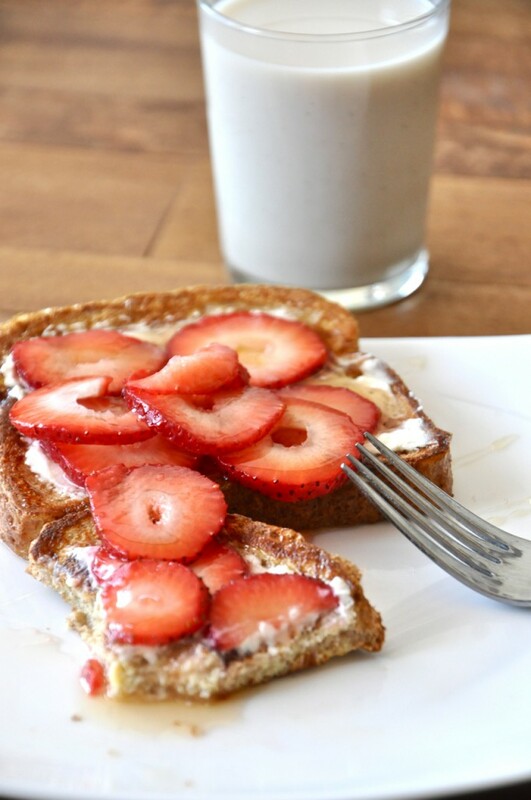 Top immediately with goat cheese, strawberries, and a drizzle of honey. 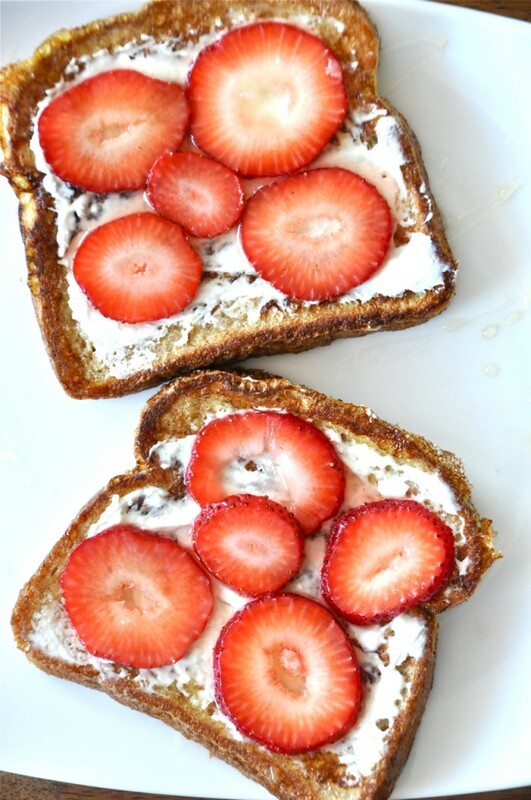 Can I make this recipe with gluten free toast? This looks delicious! 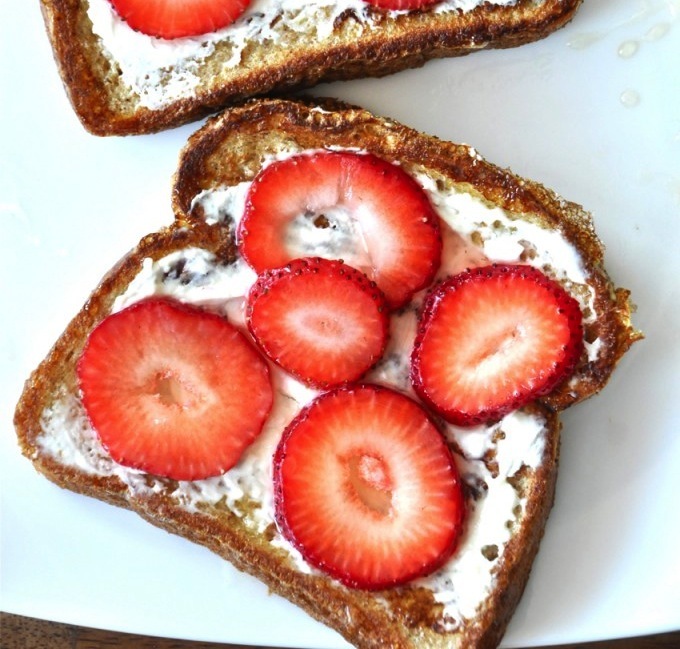 I used to love stuffed french toast as a kid and this reminds me of those amazing cheesy, berry filled breakfasts. Thanks for sharing! Found your blog through Pinterest and I am in love with your recipes. Minimalist cooking is such an interesting concept. Can’t wait to try them out! WE HAVE THE SAME DINING ROOM TABLE! World Market, yeah? Destined to be BFFs. (Is the term BFF still relevant???) Now let’s go to Iceland. DUDE, STILL RELEVANT. We’re totally BFFs, and we’re going to Iceland – YIPPEEEE!!! I don’t know whether to beg you to stop with the beautiful pictures or grovel at your feet and ask for more. Think I’ll try cream cheese instead of goat cheese to ease into it. Family doesn’t like new things. Two days in a row you are hitting some favs of Uncle Tom’s!! Thanks for the creative breakfast idea!! It looks so good, I can’t wait to make this!!! I’ll have to check it out w/ goat cheese. 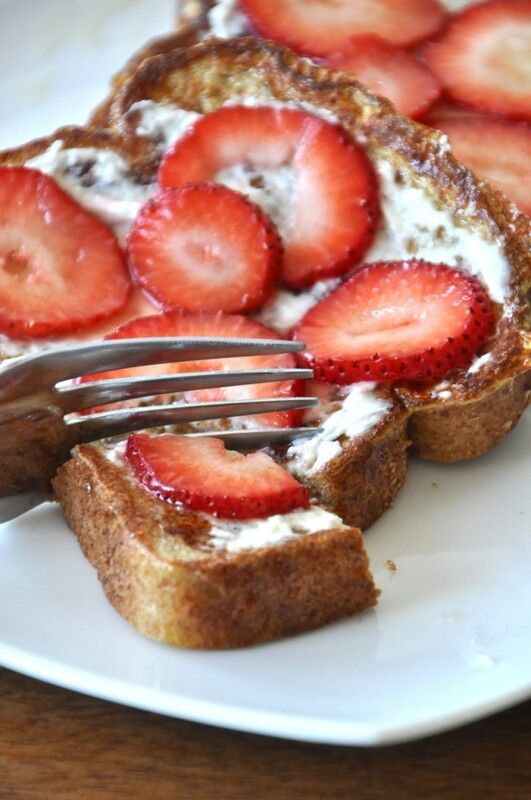 Cream cheese, strawberries, honey on french toast has been my go to for years. I saw your chocolate chip oatmeal pancakes on Pinterest. It didn’t take long for me to figure out I LOVE your blog! Keep up the amazing work! Yes. Goat cheese is my life…looks delicious!